Brands and cost less which makes Kroger's products even better! 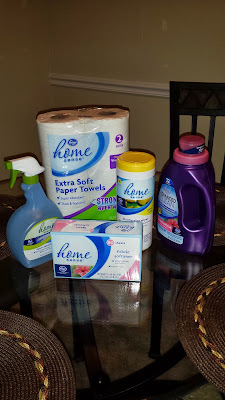 I had the opportunity to get free household products to review from Kroger thanks to BzzAgent.com, since I'm a agent with their company. BzzAgent gave me free coupons to redeem the free products at my local Kroger store. The household products I got to tryout were Kroger Home Sense Advanced Clean Laundry Detergent, Kroger Home Sense Fabric Softener Sheets, Kroger Home Sense Disinfecting Wipes, Kroger Home Sense Extra Soft Paper Towels, and Kroger Home Sense Fabric Refresher Spray. Kroger Home Sense Advanced Clean Laundry Detergent- This laundry detergent is compared to the National Brand Gain. All I use is pretty much Gain due to the smell and how well their detergent cleans my families clothes. This Kroger brand laundry detergent was just as good as Gain and had my clothes looking clean and smelling really fresh for days! Kroger Home Sense Fabric Softener Sheets- I don't use fabric softeners anymore since I really didn't see a need for them since my clothes never have static after my clothes are dried. Also my clothes already comes out smelling good without them. Now, when it comes to softness of my clothes after coming out of the dryer, it's not that soft. After using Kroger Home Sense Fabric Softener Sheets, it made me change my mind about not using softener sheets in my laundry. My clothes came out very soft and gave my clothes a boost of scent. Kroger Home Sense Disinfecting Wipes- These disinfecting wipes makes cleaning so much easier and leaves a pleasant lemon smell. The texture of these wipes is thick so it doesn't tear through when cleaning. Also one sheet does a good job with wiping down my kitchen counters. These wipes cleans just about anything! I also like the fact that it kills 99.9% of common household bacteria and doesn't contain alcohol. Kroger Home Sense Extra Soft Paper Towels- I love these towels because of its thickness and how well it cleans up small and big messes without tearing apart. My only complaint about these towels is that it comes in small rolls and I wish they had bigger rolls. Kroger Home Sense Fabric Refresher Spray- I don't use fabric refreshers since it smells so artificial to me and when the strong smell gets in my lungs, it makes me feel sick. But not this refresher spray! It has a light pleasant smell that made my home smell fresh and not smell like I'm trying to hide an odor. To me, this spray is better than the leading brand Fabreze! Is Kroger's Home Sense Household Products Worth a Try? I really enjoyed using these products and will be buying them more often. Plus, I'm saving money switching to Kroger. If you have Kroger in your area, you should try all their products! Interesting. I decided to take their "compare to Bounty" printing on the packaging for their Home paper towels. And they lost. No where near as absorbent as Bounty. I won't be buying this anytime soon. IT is a SAFETY and HEALTH hazard. Wondering if I should try to call the EPA !! Your BLEACH containers for the Kroger HOME sense brand is way to THIN. My gallon of bleech developed a "pin hole" and leaked all over under my laundry tub vanity and ruined stuff. I won't be BUYING your product anytime in the near future!! and the way your complaint/corporate line is, I seriously DOUBT I will ever hear from you!!!!!!!!!! I don't believe you care! AND the sprayers on the glass cleaner and the disinfectant kitchen cleaner (they are the same sprayer) DO NOT WORK. Once you've used about 1/4 of the product, the sprayer head begins to leak down your hand. The plastic is flimsy, even the tube is weak. RALPHs/Kroger had 'Glass Plus' store brand with a much better sprayer. This is NOT a way to make a profit. I will now have to buy a standard expensive brand.